Even though I’m fairly tech savvy, I’ve had a difficult time with Microsoft Outlook recently. I’ve had to reinstall it on my desktop and laptop computers. As fate would have it, an application called Plaxo that I was using to synchronize my contacts between all my email accounts and devices went out of business after 15 years at about the same time Outlook crashed. Long story short, I lost all my email contacts. I’m appealing to you to please email me at randepayne@comcast.net so that I can start rebuilding my contact database. Thank you in advance for your help. Lesson learned: Back up your email contacts to an external hard drive! Shifting gears to something a little more uplifting, I had the honor of naming two tribal members in late January. Sisters Mary Ellen and Patti Pierson from the Lancaster area attended the Culver City District gathering in October. Shortly after, they requested names. After sending them some information about the Potawatomi naming ceremony, I received their gift of tobacco. 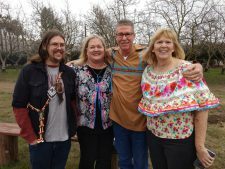 I’m so appreciative of Mary Ellen and Patti’s strong desire to obtain their Potawatomi names. Both were passionate about understanding the process and easy to work with. They were more than willing to make the drive up to Visalia and brought a feast fit for a king. Patti’s son Ian did the driving and sponsored his mother and aunt. Patti and Mary Ellen’s sister Deborah Kocol made the trip, as well. Their names didn’t come easily. Maybe it was because this was the first time I have named more than one person at the same time, combined with the fact they are sisters. There were so many similarities between them it was easy to tell they were siblings. Once I started praying and putting down tobacco for each of them individually, their names became clear. It was an interesting process and worth the extra effort. It was a clear but very chilly day, but the warmth of the fire and friendship was heartwarming. It was a blessed day and one I will not soon forget. Thank you, Mary Ellen (Mbishkwe), Patti (Mbwakakwe), Ian and Deborah, for a truly wonderful day. As of this writing, Feb. 1, registrations for the March 10 San Diego gathering are starting to come in. I look forward to seeing you there. In closing, I want to take the opportunity to say thank you for your support. Because I am running unopposed in this year’s election, I have the privilege of already knowing I will be serving the members of District 6 and our great Nation four more years. It is humility and love for our people that drive me to serve to the best of my ability. I consider myself very blessed to have the opportunity, and I am very grateful. Igwien (heartfelt thanks). P.S. Please remember to send me a quick email, so I can add you to my contacts. Migwetch (thank you)!